On our way down to McMinnville for the IPNC Passport to Pinot we were invited to swing by and check out Solena Estates brand new Grand Cru Estates facility outside of Yamhill. The Grand Cru Estates facility, which opened last November, sits right off 240 and is a sight to behold as you pull up the gravel driveway. Lynnette showed us around the facility and we tried to stay incognito so as to not disturb some IPNC guests there for a blending seminar and lunch. Grand Cru Estates, in Lynnette’s words, is "a sort of country club, but instead of golf, the focus is wine." This is perhaps the most genius thing I've heard in a while, and let me explain. Wine is the celebration of life, of living, in both a literal sense and also in a kind of olde timey Bacchanalian sense assuming that by "old timey" you mean Greek mythology. Which is exactly what I'm talking about. Further it is my personal opinion that golf is the opposite of the celebration of life, it's rather the celebration of aging, an acceptance of the regrettable reality that no other athletic endeavors are available to my frail frame anymore. "I should look into this golf thing." Grand Cru members make their own wine with the fruit from the Solena Estate vineyards. Members can make a 1/4, 1/2 or full barrels of wine, and they really get to do everything from blending to racking. There are currently 30 or 40 members of the club, and members get access to the entire facility for one full day each calendar year, a private club room with lockers for wine, and a ton of other cool benefits. 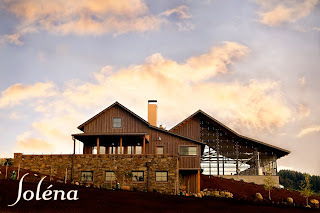 The Gran Cru facility is also the production facility for Solena Estates, where they’re making wines with a focus on Willamette Valley Pinot Noir and a lot of warm weather varietals grown predominantly in Southern Oregon. Some of the fruit, however, is sourced from Washington, specifically the acclaimed Klipsun Vineyard. I have to chuckle at the "warm weather" distinction because it was 96 degrees in the Willamette Valley on the day of our visit. In addition to the tour and rundown of the Gran Cru club we also got to taste through the wines being made by Solena Estates. They make a variety of excellent single vineyard Pinot Noirs as well as a Cuvee and Pinot Gris. The 09 Pinot Gris is sourced from 3 different vineyards including one from Southern Oregon. This was the first of two such Gris we tasted on our trip that was blended this way (Panther Creek also does one). I think it's the way to go for Oregon. While it may not be a "proper" AVA wine, the result is undeniably delicious. The strength of the Willamette AVA grapes balance extremely well with the acidity present in the Southern Oregon inclusion to really round out the wine. Enough messing about, onto Pinot Noir. Solena Estate makes a couple different single vineyard Pinots, as well as a Cuvee. All of their Pinots are quite nice but for the sake of time I have to focus in on the Domaine Danielle Laurent Pinot Noir ($45). I strongly suggest you spend some time with this wine. First off, we had the 2007. The mystery continues for me about how people who supposedly know anything about wine could have poo-pooed this vintage for Oregon Pinot Noir. This wine is beautiful. I picked up some burnt gun powder on the nose. Saying this to Gwynne and Lynnette elicited a skeptical reaction and Gwynne asked me when I had last handled a musket. (We went on to discuss a curious scene we had witnessed in Bellingham where four lonely looking Civil War reenactors had assembled on a side street to recreate the not-so-famed Battle of Bellingham). Back to the wine. Interestingly enough I just checked out the tasting notes from the winemaker. Lo and behold: "aromatics of flint." Flint, as those reenactors will tell you, is what you use to ignite the gun powder. I win. The wines from this estate vineyard, which was a wedding gift from the owners, Danielle & Laurent, to each other, is planted with several different Pinot clones. The wine is handled with kid gloves, and in small lots. Punchdowns are done in rotary barrels and all fermentation is done in small batches. The result is another more than capable spokesman for the 2007 vintage out of Willamette Valley. We found ourselves compelled to purchase a bottle to take home. If you’re in the Valley, pay a visit to this beautiful facility. If you live out that way, hang up the golf clubs and start making wine instead. It's way more fun. Ha - you DO win Clive! Thank you for such a thoughtful and compelling post. I hope to see the two of you back here again soon. I do! That place is so amazing. I am sure that I will going to have great time in that amazing place. Are those aged wine? I want to try it.